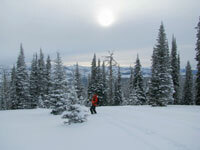 Most ski families have never heard of Brundage, that’s why it’s such a great place to ski in Idaho. Located in the fun frontier town of McCall in western Idaho, Brundage Mountain is reputed (albeit rather quietly) for Idaho’s best snow. Brundage Mountain Resort is a family owned and operated ski area with 1,900′ vertical, abundant natural snow and awesome scenery of Payette Lake, the Salmon River Mountains, Seven Devils Wilderness and Hells Canyon. Lifts at Brundage open at 9:30, a very relaxed pace with no lift lines. Our family loved the base to summit high speed Blue Bird Express quad. Brundage’s trails are fun, fantastic cruisers. From the 7,640′ summit you can drop over to the Frontside to Lakeview Bowl or take a long twisty run on 45th Parallel or Engen – in remembrance of Cory Engen, the Olympic jumper who started Winter Carnivals in McCall in 1924. When you are ready to get off the groomed track, hit Hidden Valley glades and you will likely come out with a big snowy smile. Brundage Mountain Resort is an ideal family mountain, reasonable rates, no crowds amid 1,920 acres, plus excellent learning terrain on Easy Street and the Bear Chair. Brundage’s homey 1961 A-Frame base lodge has been expanded. We loved the Idaho potato bar, and the warm friendly feel. Brundage was surrounded by national forest up until a land swap was completed a few years ago, so there is not yet any slopeside lodging. We recommend you stay at the Shore Lodge in McCall. On the southern shores of beautiful Payette Lake is this elegant log inspired 1948 Lodge also known as the Whitetail Club. 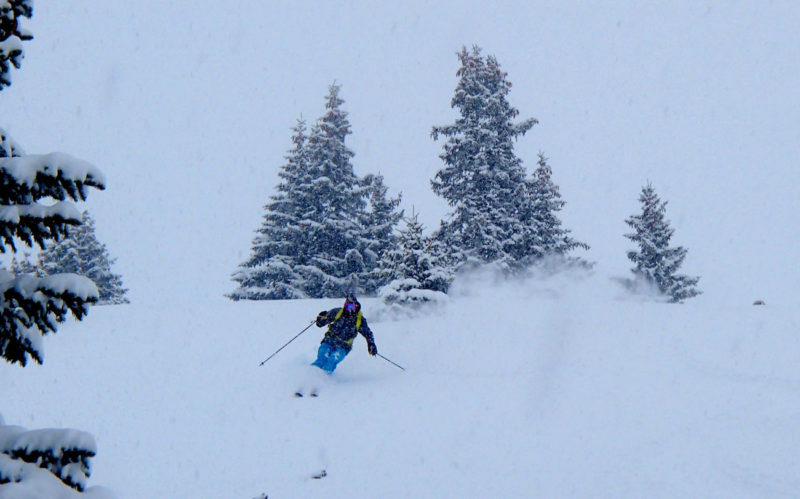 Go Brundage Cat Skiing if you really want to treat your family to an Idaho powder day. The cat ski operation makes daily trips to 18,000 acres of powder filled Payette National Forest, full or half day ($299/ or $199). You and your kids should be expert skiers with some powder and glade skiing experience. This is a great day of guided backcountry powder skiing with a snow cat as your personal armored tank to awesome untouched terrain. See Tips on Cat Skiing.